Do you often find that the nimble keys on the iPhone 4 make it difficult to type? Do you prefer the tactile, solid nature of a keyboard? Introducing the NUU MiniKey Keyboard Case for iPhone 4. A new, innovative and practical alternative to the iPhone 4 touchscreen keyboard. 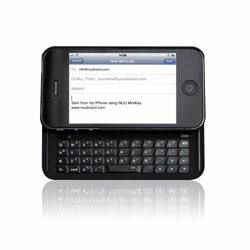 The NUU MiniKey allows iPhone 4 users to have greater typing functionality through its custom built keyboard. 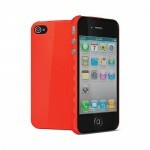 Place your iPhone in the case, slide the keyboard out and type away! Whether you’re texting, emailing or blogging, the NUU MiniKey is a fitting alternative to using the onscreen keyboard on your iPhone. Speedy Typing – Enjoy greater typing speed and accuracy than you could from using the on-screen keyboard. Perfect for blogging and emailing, or if you just prefer something tactile to type with. Larger Screen Area – By eliminating the need for the on-screen keyboard, the NUU MiniKey allows for the screen’s viewable area to double while typing. Easier Navigation & Editing – The navigation keys allow you to locate a particular spot in your composition with greater ease than you would by using the touch-screen. Use these with the command and shift keys for even greater keyboard functionality. Type Symbols Quickly – A range of commonly used symbols can be typed quickly and easily at the press of the Function key, eliminating the need to search for them on screen. Brilliant Backlight – The backlight keyboard makes typing in poorly-lit areas much easier. Clever Command Key – The Command key allows for editing shortcuts, such as Copy and Paste, just like on a traditional keyboard. With these shortcuts, you can select and edit text quickly and easily on your iPhone. Easily Accessible Toggle Button – A conveniently placed toggle button allows for smooth switching between the NUU MiniKey keyboard and the on-screen keyboard, regardless of whether the device is slide open or closed.